Recently, we were able to read the first Sir Kaye book. We loved it so much that we were even more excited to read the second book Sir Kaye Boy Knight: The Lost Castle Treasure by Don M. Winn and illustrated by Dave Allred. We barely made it a day without starting the new book. Noah wanted to start it the night we finished the first book, but it was past his bedtime, so I was ready for bed. We both couldn’t wait to see what adventures Kaye and Reggie were about to find themselves in. Whatever it was, we knew this was going to be a great story. I was so glad that Don sent me both books for us to enjoy. It would be torture not to find out what happens after the first book. There’s also a third book coming out soon. We have to read that one too. I was hoping that the books were available in the accelerated reader program that Noah’s school uses for reading. Once again Don wrote an exciting book with lots of adventure. We also loved the mystery and suspense that Sir Kaye the Boy Knight: The Lost Castle Treasure brings. Noah’s favorite character is Reggie, the main character/ narrator. He likes Reggie because he is cool and he is an explorer. Noah also likes Kaye because he wants to be a knight. We talked a little about bullying when the knights were not being nice to Kaye because they don’t think he is worthy of being a knight. I love when I can use books to help start a conversation with Noah. Noah was the one who said that the knights were being bullies. He thinks that there’s room for anyone who wants to be a knight should be one. I agreed with him completely. Noah loves the medieval time period even more now. He wishes he had a time machine so he could visit. I told him we don’t have a time machine, but thankfully through the Sir Kaye the Boy Knight Series, we can be transported through the story. Once again, I highly recommend any of the Sir Kaye the Book knight Books. I think that you definitely have to read them in order. I hope that Don will keep writing so we can keep reading them. 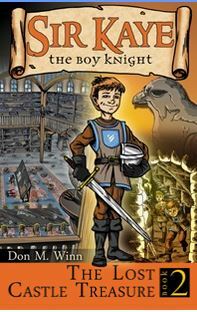 Sir Kaye the Boy Knight Book 2 The Lost Castle Treasure is available in hardcover, softcover, e-book for Kindle, Apple and Android. It is also available in audiobook. You can find it on Amazon and at Barnes and Noble and select local bookstores. For more information please visit Don M. Winn’s Website.